Nephew of Napoleon I, being the son of Louis Bonaparte (the King of Holland) and Hortense the Beauhanais. After the death of his elder brothers he inherited the Bonaparte claim to the throne of France. His coup d'état of 1836 failed and he was put on the ship Andromède that took him to Norfolk. He enjoyed himself for a while in New York, but when his friend Dr. Conneau sent him message that his mother Hortense was dying ('Venez, venez!') he took the ship George Washington to London. Using a Swiss passport he travelled incognito to Arenenberg; the French agents that were put on his track failed to stop him and he reached Hortense in time on August 4th, 1837. She died two months later. In 1840 his second coup d'état failed too and Louis Napoleon was imprisoned at the Ham fortress. There he taught his parlourmaid Alexandrine orthography and she gave him two children in return. On May 20th, 1846 he sent her away and six days later he escaped. By the time it was noticed he was already on a ship to London. After the revolution of 1848 he came to Paris and the National Assembly granted him permission to stay. Soon he was elected in parliament and in December he was elected president with a huge majority over Cavaignac. When he visited his old prison at Ham in 1849 it was inhabited by Bou-Maza, an Arabian who had fought against the French. Louis ordered his release. On December 2nd of 1851 he imprisoned many of his opponents and this third coup d'état succeeded. 'His' Senate asked him to become emperor and a in a referendum his plan was confirmed with an enormous majority. On December 2nd of 1852 the empire was restored and he took the name Napoleon III, with due respect to the first Napoleon's son who never ruled France at all. On January 30th of 1853 he married Eugénie de Montijo, who provided him with an heir in 1856. Allthough he was by no means a brilliant military strategist like his famous uncle, he enjoyed some military successes in the Crimean War as well as against the Austrians. Perhaps more important, under his reign France was modernized in many ways. In 1862 Maximilian of Austria became emperor of Austria under protection of French troops. When Louis Napoleon wouldn't continue the french military presence in Mexico in 1867, Maximilian refused to give up his throne and was soon afterwards executed by his rebellious opponents. For Louis Napoleon this was the beginning of the end. His health started to fail and he tried to liberalize his empire in order to preserve it for his son. But in 1870 he was outwitted by Bismarck's secret diplomacy and under pressure of the public opinion he had to declare war on Germany. Unfortunately he was completely misinformed about the strenght of his army and defeat soon became inevitable. Louis Napoleon joined the troops, but his personal courage was to no avail. He surrendered at Sédan on September 1st, 1870 and was taken to Germany as a prisoner of war. The French refused to accept his capitulation and overthrew his empire. This resulted in the disastrous defeat of 1871 and the loss of Elsace-Lorraine. As a prisoner of war, Louis Napoleon lived for a while at Wilhelmhöhe (near Kassel). 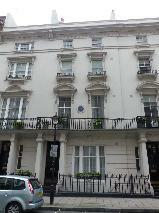 Ater his release in March 1871 he spent his last few years in England. He died after a gall-stone operation and was buried at St Mary's Catholic Church in Chislehurst. Later, Eugénie decided to build a monastery and a chapel and in 1888 his body was buried there as well as that of his son who had been killed by the Zulus in 1879 in South Africa. 30/10/1836 The first Coup d'État of Louis Napoleon Bonaparte fails. He tried to seize power in Strasbourg but a regiment surrounded the mutineers and they surrendered. Louis fled to Switzerland. The French wanted his extradition to French, but he was a Swiss citizen and the request was refused. He left Switserland voluntarily and after a short time in prison he was put on a ship to the USA. 9/11/1836 Louis Napoleon Bonaparte is put on the stage coach to Lorient. There he would be brought on board of the Andromède. The captain received sealed orders that he was only allowed to open far on the Atlantic Ocean. The orders told him to sail to Rio de Janeiro, wait there for a month and then continue to Norfolk in the USA. It was clear that Louis should be out of the way during the trial of the other conspirators. The French people didn't consider it fair that the leader was freed and the others were tried. This led to their acquittal. 14/6/1848 The National Assembly votes in favour of admitting Louis Napoleon Bonaparte. De Lamartine had stopped his admission by telling lies about the Bonapartes. After he was found out a large majority of the National Assembly voted in favour of Louis Napoleon. Lamartine's next step was to spread a rumour that Louis Napoleon planned a coup d'état. 17/12/1848 Louis Napoleon triumphantly rides to the Élysée Palace. He had been elected president the week before. 21/7/1858 Secret meeting between Napoleon III and Cavour. It took place at Plombières. Napoleon was there for curing and Cavour had entered the country incognito at Strasbourg. They agreed there would be an uprising in Modena and after Austria would threaten the regio with violence, France would send troops. Their meeting wasn't a secret for long and many guessed what they were up to. 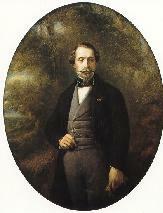 4/8/1858 Napoleon III inaugurates the railroad between Cherbourg and Paris. He had arrived at Cherbourg that day accompanied by empress Eugénie. 7/8/1858 Napoleon III dock inaugurated at the harbour of Cherbourg. Napoleon III and empress Eugénie were there. Queen Victoria and prince Albert had arrived on August 5th as well, but they had left early because they didn't want to witness the unveiling of a statue of Napoleon I that took place on the same day. This statue by Armand de Veel is still there. 'Napoléon III' by Franz Xaver Winterhalter (Musée National du Château de Compiégne, Compiégne). 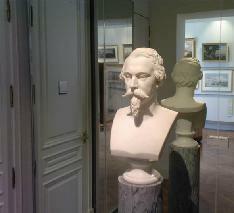 Bust of Napoleon III at the Musée Masséna, Nice. 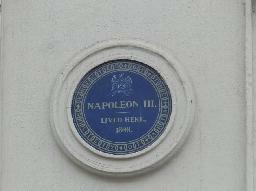 Plaque for Napoleon III at 1c King Street, St James's, Westminster, London. 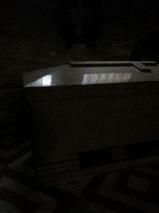 The tomb of Napoleon III in the Abbey Church of St. Michael, Farnborough. 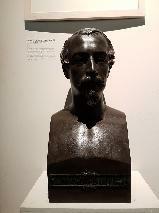 Buste of Napoleon III at the Musée d'Aquitaine, Bordeaux.